When I was an Andy Frain usher in the 1960s, we were everywhere – baseball, football, hockey, and basketball games, plus professional wrestling, roller derby and concerts. What happened to them? They’re still around! The Frain family exited the business in 1996, but it was reopened under new management not long after and they are still in business today. More on that later. The ushers were fixtures at most of the Chicago’s sporting venues and cultural institutions. The company was started in 1924 by a teenager from the Back of the Yards neighborhood named Andrew T. Frain. Family legend is that he learned the art of crowd engineering by directing his 16 siblings in and out of the family’s single privy. Frain started the usher service as a way for owners to end the gate-crashing and usher-bribing that was rampant at sports venues in those days. He rounded up some burly friends from the neighborhood and convinced the White Sox that he could do better with his honest, unbribeable ushers. Four years later, honest Andy won Wrigley Field’s business, too. William Wrigley Jr. advanced him the cash to buy the blue uniforms with gold braid trim that became a Frain hallmark. Pretty soon, Andy Frain ushers became an institution themselves. If anything was happening or if anyone of note was in Chicago, an Andy Frain usher was there. Frain, who never even finished grade school, eventually expanded the business across the country. Frain ran the company with military discipline. Male ushers had short haircuts and were clean shaven. 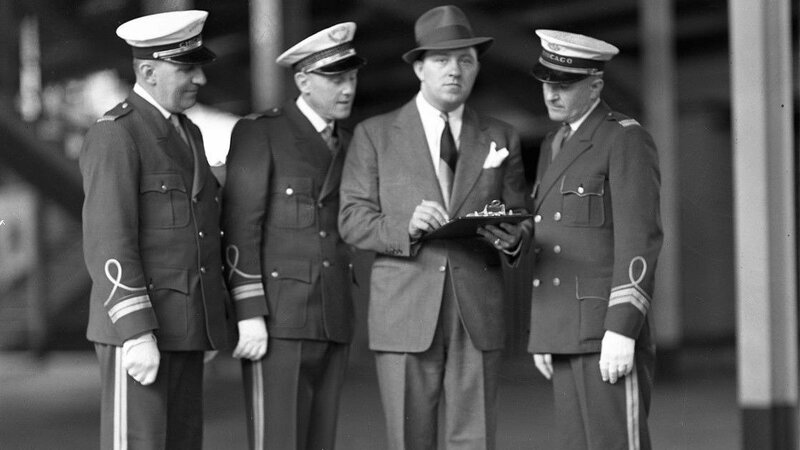 When he began hiring female ushers, Frain said he hired women who used “soap and water, not paint and powder.” Ushers were required to use polite language and not allowed to slouch, smoke, chew gum, or eat or drink in front of spectators. Many former ushers attributed success later in life to the training they received as Andy Frain ushers. And their expertise extended beyond crowd control. Andy Frain ushers would get hired as drivers, parking attendants, pallbearers, even emergency prom dates for jilted girls. At hockey games an Andy Frain usher would sometimes be dispatched to sit in the penalty box between players who had been fighting on the ice. Frain said in an interview that he even offered professional criers to show up at funerals. When Andy Frain died in 1964, his three sons successfully took over the business until they sold it to investors in 1982. After that, the company went through a string of bankruptcies and ownership changes until 1996, when the trade name was purchased by the new owners, who have offered security services under the Andy Frain name ever since. I seem to recall in the late ‘60s-early ‘70s, there was a well-liked police officer who did morning traffic reports for WGN-TV who died when his helicopter crashed. I was quite young at the time so I'm a bit fuzzy on the details. What can you tell me about this? Sadly, not one, but two Chicago helicopter traffic officers were killed in helicopter crashes about a decade apart. The police officer our viewer remembers is patrolman Irv Hayden, who was the voice of WGN’s traffic reports for more than 10 years beginning in 1961. During his time as WGN’s “Eye in the Sky,” Hayden was credited in a Chicago Tribune profile with coining some terms about Chicago’s traffic that have lasted to this day, including “gapers block,” meaning the clot of drivers who slow down to look at accidents, and “Hubbard’s Cave,” the series of expressway underpasses on the Kennedy around Hubbard Street. Hayden was killed along with his pilot David Demarist in August 1971 when the low-flying helicopter struck power lines and crashed in the suburb of Bellwood. And as if that isn’t awful enough, the helicopter traffic reporter he succeeded, Officer Leonard Baldy, was also killed in a crash. In 1958 Baldy became Chicago’s first helicopter traffic reporter on WGN. The eight-year veteran of the Chicago Police Department was assigned to the department’s Safety Education Bureau when he joined the force because he had spent time as a CTA bus driver and knew the city’s streets well. In May 1960, as Officer Baldy was en route to giving a report, the helicopter threw a rotor blade and crashed near Milwaukee Avenue and Hubbard Street. Baldy and the pilot H.G. Ferry were killed in the accident. In 2006, both Baldy and Hayden were remembered with honorary street designations near WGN studios on the North Side. Note: This edition of Ask Geoffrey originally aired on “Chicago Tonight” on Dec. 13, 2017.